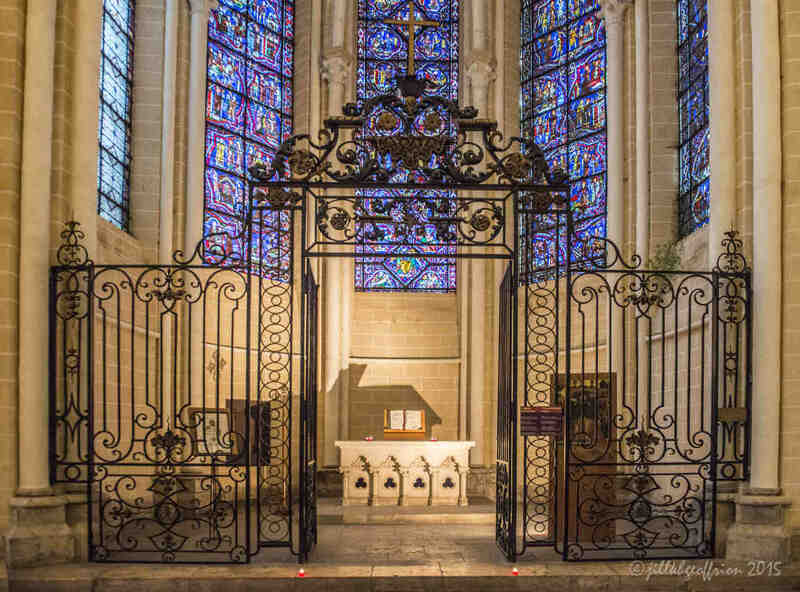 Chartres Cathedral was constructed to honor God, offer support to Christ’s followers, house Mary’s relic, and to foreshadow the Heavenly Jerusalem. The cathedral was built to both inspire and teach, communicating who God is and who we are in light of who God is. The language used is architecture based on an understanding of ratio and proportion. No study is necessary, human bodies seem to “get it” naturally, although the more you learn, the more you will appreciate both the simplicity and complexity of the building and its ability to support those who come. 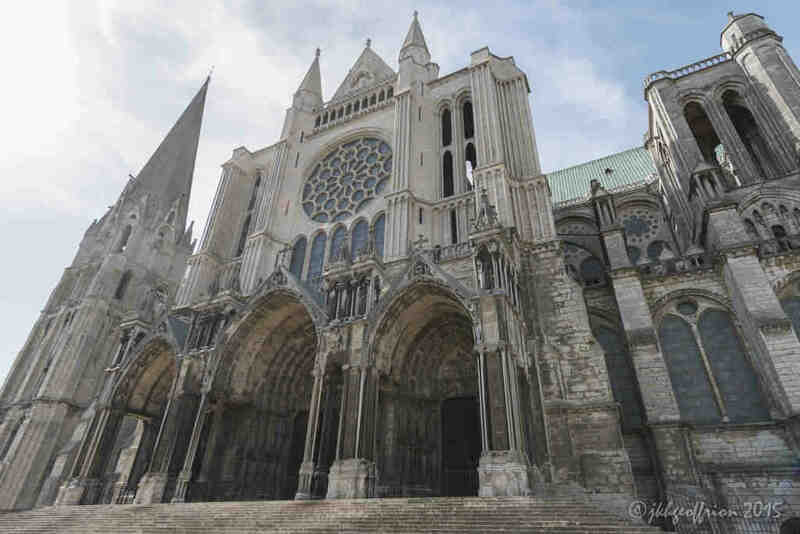 Background information (facts) about the Chartres Cathedral. Let the cathedral introduce itself as you walk around the outside. Meet the cathedral as you go inside. The Love of God: It is expressed throughout the cathedral through image, liturgy and architecture. 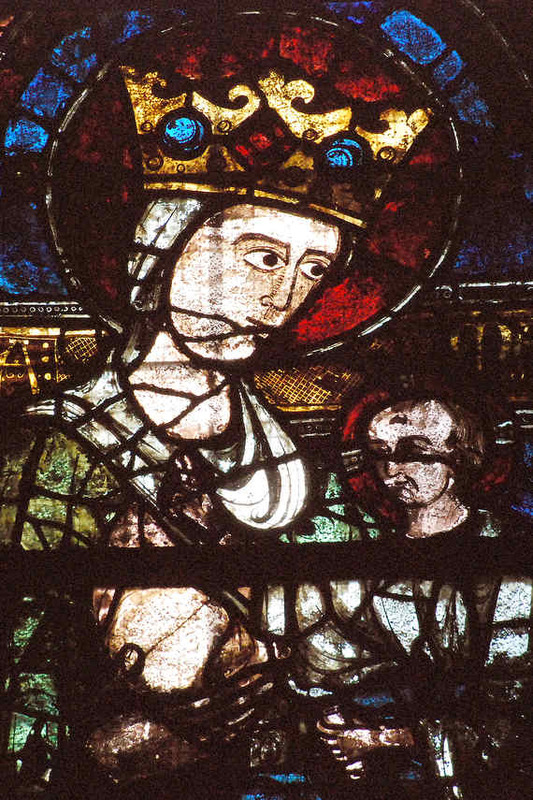 Mary as a disciple of Jesus: Mary, the mother of Jesus and the Church is seldom depicted alone in Chartres. Her role as explained through image is to direct our attention to her son, Jesus. There are more than one hundred images of Mary with Jesus at Chartres in stone and glass, to mention all the others adorning liturgical items that span many centuries. Marian symbols such a little shirts, the burning bush, or stylized Ms greet the pilgrim at every turn. Birth and Spiritual Rebirth: The principle cathedral relic is the Veil of Mary, believed to have been worn either at the annunciation of Jesus’ birth to Mary, or at his actual birth. Birth images and symbols that point to birth are found throughout the cathedral (perhaps even including the number of stones found in the labyrinth). Care for those who have been birthed are very present as well, including images such as Mary being bathed after her birth and Jesus being breastfed. Pilgrimage: This cathedral, built after the fire of 1194 and at least the fifth to stand on this site, was constructed with pilgrims in mind. Throughout the ages many pilgrims have come to Chartres to pray with the veil of Mary, one of the most important relics in Christendom. 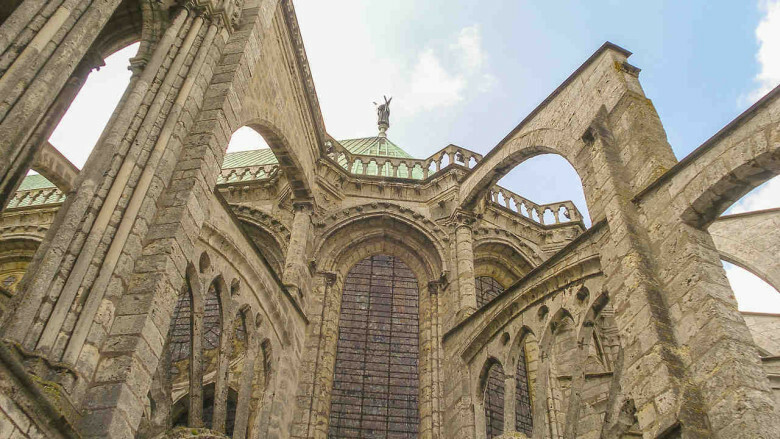 Chartres is on the Chemin de Saint Jacques, The Camino pilgrimage route to Compostela in Spain; there are many images of St. James here that serve to encourage pilgrims on their journeys. The architecture of the crypt as well as the upper church take into account the needs of pilgrims as well, having ample room for processions, services, and prayer. Mary offering her breast to Jesus, Clerstory window in the south nave. What is God communicating to me through the cathedral? How is God using this place to transform my faith and life? Then one of the seven angels … came and said to me, “Come, I will show you the bride, the wife of the Lamb.” And in the spirit he carried me away to a great, high mountain and showed me the holy city Jerusalem coming down out of heaven from God. It has the glory of God and a radiance like a very rare jewel, like jasper, clear as crystal.It has a great, high wall with twelve gates, and at the gates twelve angels, and on the gates are inscribed the names of the twelve tribes of the Israelites; on the east three gates, on the north three gates, on the south three gates, and on the west three gates. And the wall of the city has twelve foundations, and on them are the twelve names of the twelve apostles of the Lamb. The angel who talked to me had a measuring rod of gold to measure the city and its gates and walls. The city lies foursquare, its length the same as its width; and he measured the city with his rod, fifteen hundred miles; its length and width and height are equal. He also measured its wall, one hundred forty-four cubits by human measurement, which the angel was using.The wall is built of jasper, while the city is pure gold, clear as glass. The foundations of the wall of the city are adorned with every jewel; the first was jasper, the second sapphire, the third agate, the fourth emerald, the fifth onyx, the sixth carnelian, the seventh chrysolite, the eighth beryl, the ninth topaz, the tenth chrysoprase, the eleventh jacinth, the twelfth amethyst. And the twelve gates are twelve pearls, each of the gates is a single pearl, and the street of the city is pure gold, transparent as glass. For more information see: Prache, Anne. (1993). Chartres Cathedral. Image of the Heavenly Jerusalem (Janice Abbott, Trans.). Paris: CNRS Editions. The wikipedia introduction to the cathedral. L’introduction de la cathédrale de Chartres par wikipedia. Would you like to receive updates from Jill about her events and publishing? Sign up here. 2016. "Cambodian Labyrinth Experiences." Labyrinth Pathways 10. 51-58. Description & photos of ministers praying the labyrinth in Cambodia. 2016. "Labyrinth Doorways. Crossing the Threshold." Jill K H Geoffrion and Alain Pierre Louët. Caerdroia 45: 11-31. A consideration of the depictions of labyrinths with doorways in medieval manuscripts. 2015. "The World's Largest Labyrinths. Labyrinth Pathways 9:15-18. A discussion of the labyrinth line drawings on the Nasca Plain in Peru. 2015. "The Beast Within" by Jill K H Geoffrion and Alain Pierre Louët. Caerdroia 44: 10-23. A consideration of the centers of labyrinths in medieval manuscripts, including the 10th century labyrinth in Orléans BM 16.